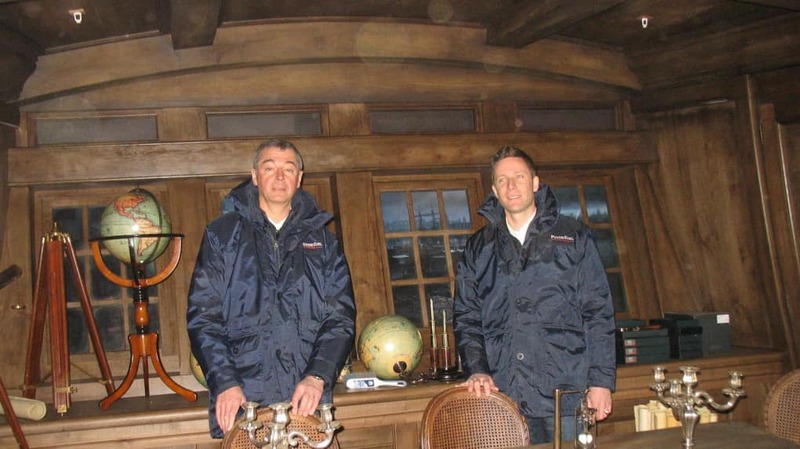 The new La Pérouse attraction opened at Le Puy du Fou theme park in April. The most impressive and widely cited fact about it is the tremendous cost of construction - a cool 10 million euros. This has mostly gone into recreating a state-of-the-art computer-controlled mock-up of La Boussole, tossing to destruction on the stormy seas of the South Pacific. The back-story for the new attraction is provided by the presence near the Park of the château du Fief-Milon at Boupère, the birthplace of another forgotten member of the expedition, the captain of the Boussole, Anne-Georges-Augustin de Monti. 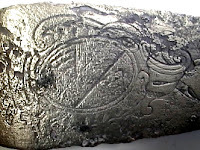 In 2002 Alan Conan visited Monti's decendants to show them a silver fork recovered from the wreck off Vanikoro which featured the Monti coat-of-arms. 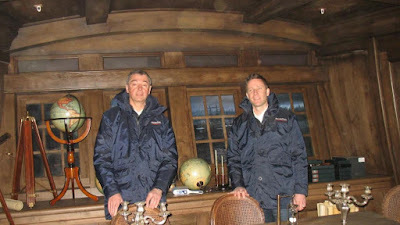 Aymar de Monti, a member of the Association du Puy du Fou, recounted the circumstances to Philippe and Nicolas de Villiers, who were taken with the shipwreck theme. An emblazoned plate forms the fils rouge running through the presentation. 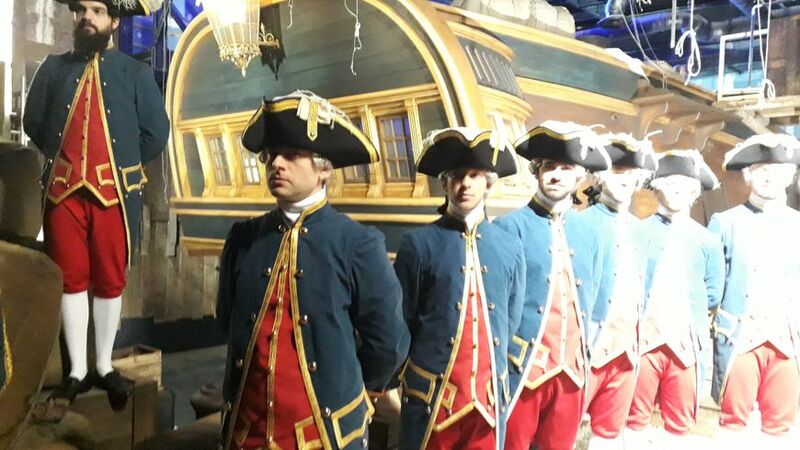 Visitors are taken through the various phases of the voyage [see the press release for details]. The attraction occupies about 15-20 minutes. 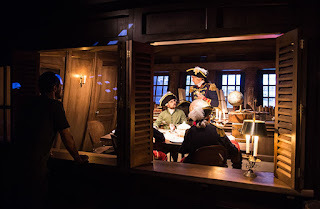 There are now several videos on Youtube, though the experience is quite hard to film due to the semi-darkness and the simulated rolling of the ship. I must admit I have been spoilt by Disneyland and was expecting a ride or even a little boat to go on: at Le Puy du Fou you have to walk. That said, the effects are impressive and the visit is enlivened by the fact there are live actors to take the parts of the crew. This post probably ought to end with some suitably disparaging comments on the limits of re-enactment or the distortion of the past represented by history as mass entertainment. It is certainly a shame that so much money was lavished on this extravaganza when the little La Pérouse museum in Albi has such a financial struggle. However, I am not going to complain too much. At least La Pérouse is remembered and people are encouraged to imagine life on an 18th-century ship; Le Puy du Fou will turn a huge profit and everyone will have great fun! Making-of "Le Mystère de La Pérouse", Official video from Le Puy de Fou, 24.05.2018. Nicolas de Villiers, President of Le Puy du Fou and Laurent Albert, Director General of the Park, present the project in its final stages.